Colours correspond to Class of Recommendation. *Atropine should not be given in patients after heart transplant. †In patients with drug toxicity and severe symptoms, preparation for pacing should proceed simultaneously with pharmacologic treatment of drug toxicity. AADs indicates antiarrhythmic drugs; AV, atrioventricular;BB, beta blocker; CCB, calcium channel blocker; COR, Class of Recommendation;ECG, electrocardiographic; H+P, history and physical examination; IMI, inferior myocardial infarction; IV, intravenous; PM, pacemaker; S/P, status post; and VS, vital signs. Autonomic derangements during an acute MI are common, and small case series suggest that atropine can be used to increase heart rate. Atropine appears to be safe in those patients with atrioventricular nodal block in the absence of infranodal conduction system disease. In contrast, it is important to recognize that the use of atropine in patients with infranodal conduction disease or block can be associated with exacerbation of block and is potentially of harm. Aminophylline/theophylline has also been examined in this setting, and in the context of very limited data appears likely to be safe if atropine is ineffective. The methylxanthines theophylline and aminophylline (a theophylline derivative) exert positive chronotropic effects on the heart, likely mediated by inhibition of the suppressive effects of adenosine on the sinoatrial node. Given that the natural course of a MI with conduction system abnormalities is frequently associated with recovery of conduction – early and unnecessary pacing should be avoided. Hyperacute T-waves are often the first manifestation of complete vessel occlusion; they are wide, bulky and prominent. Hyperacute T-waves are not necessarily tall, and small T-waves can still be hyperacute when paired with a low-amplitude QRS complex. De Winter T-waves represent LAD occlusion (a STEMI equivalent) requiring immediate revascularization. Previously inverted T-waves can appear normal and upright in the setting of acute vessel occlusion. This is known as pseudonormalization. 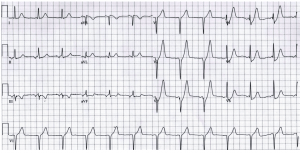 The tall T-waves associated with hyperkalemia are sharp, pointy, symmetric, and have a narrow base. When in doubt, get serial ECGs (every 15 minutes) and use adjunctive information. The risk of ACS in patients with negative biomarkers and normal ECGs approaches 0.2%. Prior risk scores, such as TIMI and GRACE, provide little, if any benefit, in risk stratification for ED chest pain patients. The HEART score and pathway can risk stratify patients into three separate categories: low (0-3), moderate (4-6), and high score (> 7). Low-risk patients on the HEART pathway demonstrate likelihood of ACS that approaches < 1%, and it is easy to use in the ED. Risk factors, history, ECG, troponin, follow up, gestalt, patients with points 3 or 4, and research design are areas of potential weakness. Further improvement of the HEART pathway at this time is difficult, but in patients at moderate risk, CCTA may hold promise for evaluation of risk. This requires further study. This is a great example of how the dichotomy between STEMI and Non-STEMI is false. They are both due to thrombus in the coronary artery and both are very dangerous. STEMI and NonSTEMI exist on a spectrum. Thrombus can lyse and propagate, and NonSTEMI can convert to STEMI. This ECG assessment is designed to evaluate your ability to use simply the 12-Lead ECG to make the diagnosis of a coronary artery occlusion. It uses a standardized list of 36 ECG’s from McCabe JM, et al. Physician Accuracy in Interpreting Potential ST-Segment Elevation Myocardial Infarction Electrocardiograms. J Am Heart Assoc. 2013;2:e000268. The presence of a Sgarbossa criteria score > 3 should prompt immediate cardiac catheterization lab activation.